With the election results all but official, the work continues to honor the investment the community has made in the school district. First and foremost we must be vigilent to remember that the dollars voters approved are indeed a community investment and not an entitlement. Continue to strenghten district fianances. Passage of the mill levy override is a big step forward. We are responsible to ensure that these dollars are used as intended. In addition, as we all know, effectively managing finances is always a top priority. The board's role is to ensure that we are maximizing the value of the resources we have and ensuring that there is a clear, transparent and accurate accounting of how funds are being uses. Continue to strengthen leadership, management, teachers and staff. Again, the mill levy override will make it easier to compete with surrounding school districts to recruit and retain high quality educators. At the board level, we also must ensure that the conditions exist to enable people to succeed at their jobs and that we have systems in place to manage situations in which people underperform. Align standards, curriculum and assessments. This is the number one recommendation of the Comprehensive Appraisal for District Improvement (CADI) a study done in the spring. We have district standards for each of our instructional areas now. The problem is that they are too vague, schools interpret these differently and there are not consistent assessments to guage student learning. The process is already underway to develop clarity and consistency. The board's role will be to ensure that there is timely progress on this work; that the work on standards and assessments includes policies to support students that either exceed or fall short of standards and that schools are developing effective quality improvement programs. A strategic question we must sort through is how to balance standarization between schools with the need and demand for customization for students. Develop a portfolio of high demand focus schools, course offerings and learning environments. We must offer our students a learning experience that they value. And, we must make sure that we have the program offerings that will enable students to successfully advance beyond high school. Again, the mill levy and bond provide a big boost in this effort. The board role will be to, again, ensure timely progress on the initiatives to create focus schools, reduce class sizes and ensure that we have a robust set of course offerings for all our students. The board also has a responsibility to stay current on the needs and interests of the stakeholder groups so that the district keep pace with these needs. One area of work that needs particular attention is extended instruction for students at our low income schools. I will write more about this in the future but extending the time of quality instruction time is the only formula that has proven consistently successful in serving low income communities. That is a lesson being learned all across the country and one we need to act on. Align organizational structure with growing size of the district. Over the years, the school district has outgrown our management structure. As a result, communications with, collaboration and responsiveness to studenst, teachers, building administrators is not as effective as it could or should be. District leaders are working on ways to more effectively organize. I will be able to say more about the board role when we hear their report. Improve communications and collaboration. The strategic priorities we are taking on are big not small. The importance of effective communications and collaboration is at a premium when an organization takes on big initiatives. It also is a challenge for a time starved enterprise. But, we must not let the challenges of time impeded our efforts. We have established good intentions. Now, we must improve our execution of efforts to effectively communicate and collaborate with various stakeholder groups. And, the district will need a mutual effort on the part of the stakeholder groups - e.g. teachers, parents, community members. The board's first responsibility is to strive to be a role model for good communications and collaboration. We'll make mistakes from time to time but we must keep striving to do better in this regard. The board's second responsibility is to help ensure that effective communication and collaboration becomes an organization habit. Improve board effectiveness. I have great appreciation for each of the board members who serve their communities and the school district. I now know from first hand experience that service on the board is a time intensive undertaking. I believe we have good board members. Our priority must be to continue to improve our effectiveness as a group and our effectiveness to support district leaders, managers and staff. We need to do better at staying focused on strategic issues and strategic questions. We must resist the temptation to drop down into organization operations. The strategic priorities outlined here is a good step forward in staying focused. First some context. Colorado public schools receive automatic increases in funding each year in the amount of inflation (based on Denver-Boulder-Greeley consumer price index - CPI) plus one percent through 2010 and inflation thereafter. If Amendment 59 passes, the automatic increases go away. This implies that a school district manages expenses poorly if costs increase faster than inflation plus one percent. To make that leap in logic one has to assume that inflation plus one percent is a good proxy for a school district’s expenses. That is an extremely big leap in logic. I find this type of leap lazy at best and very frustrating. I expect more of people who pay close attention to school issues. In my frustration, I became lazy myself. I made assertions without being precise. I am learning the lesson again to let my frustration subside before I post comments. So, let me back up and be more precise. Here is a central point. CPI and the expenses of a school district simply are not the same things. It is silly to suggest that they are analogous. I will explain. The CPI is calculated by looking at changes in prices of a “typical” person’s “basket of goods.” The commenter rightly points out that this basket of goods includes food and beverages, housing, apparel, transportation, medical care, recreation, education and communication and other goods and services. Put another way, CPI or inflation, tells us how much we can buy with a dollar today compared to a dollar yesterday? Or, how many more dollars will it take to buy a typical basket of goods this year compared to last? CPI is a relevant measure for individuals receiving a paycheck. It is a measure of how well our paycheck is keeping up with the things we buy. In the case of Colorado public schools the CPI is simply a methodology to determine funding. CPI has little or not relationship to a school district’s expenses. Why? Here is another central point. The things that a typical school district buys are not the same things that a typical person buys. Thus, the ways in which housing, health care and energy are calculated for the CPI are irrelevant to calculating the typical expenses of a school district including our school district. This is a more precise way to make my original assertion. Let me provide some examples. According to the Colorado Office of State Planning and Budgeting 35% of the CPI is determined by rental costs of shelter (housing). Other housing costs include fuel and bedroom furniture. Housing costs included in CPI are not analogous to the costs of maintaining a school building. For instance, some people might employ custodians and grounds keepers to maintain their homes. But most of us can’t afford a full time custodian. Not surprisingly, custodians and grounds keepers are not included in the CPI index. But who can imagine keeping up a school – or several schools – without custodians? How about health care? Again, remember that CPI looks at the world through the lens of a typical individual – not an employer or an institution such as school districts. When it comes to medical care, CPI attempts to determine the out of pocket medical expenses that individuals experience. As the Bureau of Labor Statistics sight points out the weights in the CPI do not include employer-paid health insurance premiums. The SVVSD and other employers buy health insurance premiums. St. Vrain is doing a reasonably good job holding premiums in check. But, the district is having a similar experience as most employers. Health care insurance premiums have been going up faster than inflation. And, thus, premiums are going up faster than the rate of school funding increases. Energy is the same. It is difficult if not impossible to compare the energy (e.g. gasoline, heating one’s home) costs of an individual to the energy costs that a school district must manage. For instance, how many households manage a fleet of buses? Another factor to consider. Over time, the CPI is adjusted to account for changes in people’s buying habits. For instance, if gas prices go up an individual might decide to take fewer leisure trips. If this becomes a pattern for the typical consumer the weight given to gasoline in the CPI might be reduced. Our school district already has eliminated many, if not most, leisure trips (field trips) from its budget. Those are paid for by PTOs. A school district may have fewer "substitutes" - to use the economists' term - than a typical individual. In fact, energy is another area in which St. Vrain has been aggressive to manage and reduce costs. I am sure that there are more efficiencies to be found with energy and other areas of the district. Our operations and management team is doing a good job. Unfortunately, some of the ways in which we’re reducing costs is by skimping on maintenance. Some people call that penny wise and pound foolish – I do. And that’s one reason why the mill levy override is so important. One last point that I made in the comment section. The CPI reflects productivity gains in the economy. One of the reasons it stays low is that businesses become are able to produce goods more cheaply. This is done primarily by reducing the number of people it takes to do a job. Schools are a people driven business and are not able to achieve these types of productivity gains. I gave the example of a bank increasing by 3 times its number of customer accounts with essentially the same number of employees. But, who would recommend that kindergarten classes be increased from 25 to 75 to achieve a similar productivity gain? What’s the point? The typical school district buys far more labor than the typical individual. One more reason why the CPI is not a relevant measure of a school district’s expenses. And that’s the bottom line: The CPI is not designed as a measure for a school district’s expenses. To assert that CPI is a good proxy for school district expenses is the same as saying that apples are a good proxy for oatmeal because both contain fiber (although apples may be a better substitute for oatmeal than the CPI is for a district’s expenses). To assert that a school district manages expenses poorly based on district expenses increasing more than CPI can only be done if a person makes no effort to understand the numbers. It may be true or it may not. That’s the point. One can’t judge because CPI and a typical district’s expenses are tangentially related at best. Schools and people buy different things. I wish life was so simple that we could do a quick Google search, cut and paste a few “fact” pages and presto we have “proof.” Life isn’t that simple. It usually takes some time and some effort to understand numbers. That is the source of the frustration that was part of my comments. I am sorry I let those frustrations get the best of me, that I inflicted these frustrations on the readers of this blog, and that I rushed to make a comment without taking the time to be more precise. I take ownership of that mistake. But here’s the deal. It becomes wearisome to respond to an incessant stream of comments using numbers taken out of context or without making any effort to understand how they work (e.g. this CPI exchange) or numbers that conflate bond and mill levy dollars as if they can be used interchangeably (e.g. exchange around standards and poors). These are tactics that may be useful – even accepted – in a political campaign but they do not contribute to adding meaning to a subject nor constructively move the conversation forward. I am reminded that I must be more precise. I certainly value accuracy and recent comments have challenged me to be more precise. I welcome that challenge. But consider this. Accuracy and truthfulness are close cousins and both are extremely important, but they are not the same. One can be accurate but not truthful if the accuracy takes no account of context. I hope that we all can strive for truthfulness. On Saturday (yesterday), I joined a handful of people in the cold to show our support for 3A and 3B. We waved signs at the intersection of 17th and Airport and people honked back in response. I know others were out yesterday, too - thank you! The volunteer support for 3A and 3B is remarkable. I have never been part of a school campaign in which so many people want to publicly declare their support for our schools. 3A and 3B are a source of unity in this tough election season and unsettling economic times. I see pro 3A/3B signs in both "Republican" yards and "Democratic" yards – as well, I assume, as "Independent" yards. On October 17 and 18, the school board will look beyond Election Day. We will do best case and worst case scenario planning. Best case: if voters approve the MLO and Bond, how will we implement the plan to use these additional resources – e.g. how quickly can we restore programming in the district? Worst case: if voters do not approve the MLO and Bond, what are the short term and long term consequences? The short term consequences are likely to include new and higher fees for things such as activities and transportation. I'm optimistic that voters will approve 3A and 3B. The breadth and depth of community support gives me hope. I am encouraged by the number of highly discerning people who have examined and understand the clear needs we have as a school district. I appreciate their commitment to our community, to young families and to continuing the tradition of investing in the next generation. None-the-less, the board has a responsibility to plan for the worst, too. Most readers of this blog know that the big news in St. Vrain over the past month is that we have planned budget cuts for the 2008-2009 school year. The most significant cut is a reduction of 85 teaching positions. Many, but not all, of these positions will be eliminated through retirements and resignations. Some teachers will have to look for new jobs in other school districts. I sat with some of these teachers last week. It is not a fun to visit with people whose job you had a hand in eliminating. The teachers were highly professional. I have been asked by many people why we are making these cuts. The reasons are straightforward. Fiscal responsibility. We have excellent financial systems in place and we understand that if we maintain the status quo (including holding teacher and staff compensation constant) we will face budget deficits by next year. We receive additional funds each year in the amount of inflation plus one percent. These increases will continue through 2010 (that is the time that Amendment 23 expires). This year the inflation rate used by the state is 2.2 percent. Thus, we’ll receive a 3.2% increase in funding. At the same time, many expenses are increasing faster than inflation plus one percent. For instance, health care, energy costs and mandatory contributions to the state retirement fund all are increasing at a rate far greater than inflation plus one percent. That means something must give. In a people driven business (83% of the budget is salaries and benefits; many other budget items are mandated by the state), reducing personnel is often one of the only options available. In previous years, significant staff cuts have been made to non-classroom positions. For instance, we barely keep up with maintenance. Increasing teacher pay. 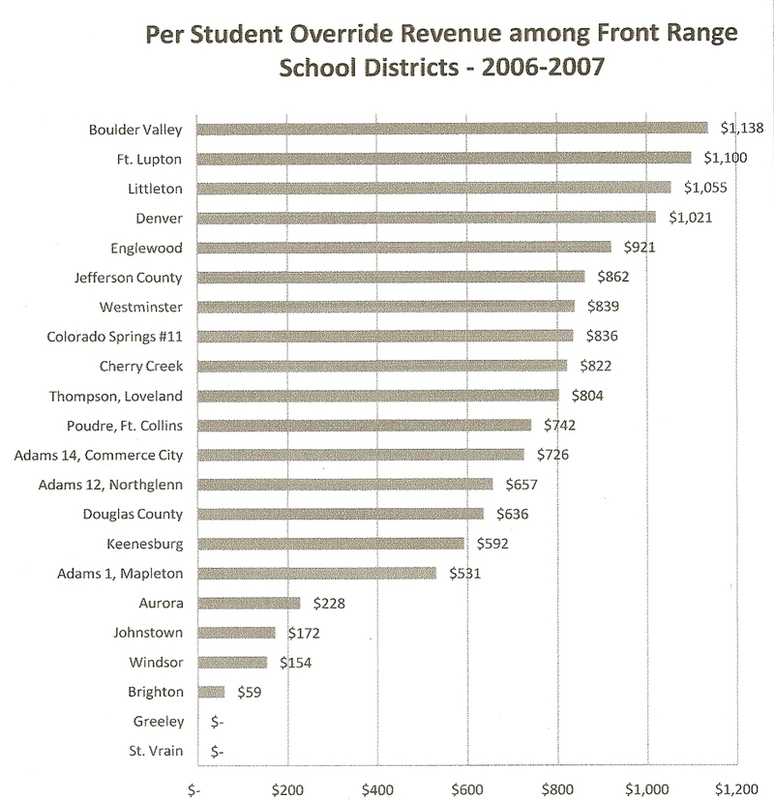 St. Vrain compensates teachers and administrators far less than neighboring school districts. As such, we are less and less competitive in our marketplace. We are more and more vulnerable to teachers choosing to leave our school district. I would argue that we are most vulnerable to losing teachers with about 10 years of experience with a master’s degree. These teachers can earn up to 15% more per year by going to districts just 30 to 40 minutes away. We’re falling behind nearby competitors in regard to base pay, too. We can debate whether or not teachers earn too little or too much. But, if you don’t pay a competitive wage, over time, you won’t attract and retain good teachers. That’s simple economics. Voters living in a school district can choose to approve higher taxes to support their local schools. These are dollars raised locally and used locally. Voters in many school districts have voted in favor of raising taxes to support their schools. Here is a comparison of override dollars, on a per student basis, voters have approved in our neighboring communities. To put this in perspective, a classroom of 25 students in Fort Collins has an additional $18,550 of funding compared to St. Vrain.